It's always difficult to review a translated work, because when you come across either brilliance or lack of lustre, it's difficult to assess whether that boon or bane is attributable to the author or the translator. 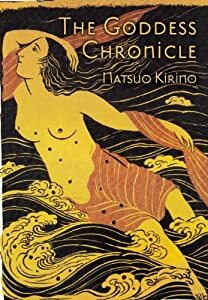 Such is the case with <The Goddess Chronicle</i>, by Natsuo Kirino, translated by Rebecca Copeland. The story is a retelling of an original Japanese creation story. I suspect the original work by Kirino is a charged, tight story. Copeland's translation, however, lacks passion, and certainly this is a story about passion, in fact eons of passion as we trace the history of the Yin/Yang gods of Izanami and Izanaki through the mortal lives of Namima and her unscrupulous lover. There is much here of sibling rivalry and betrayal of sacred trusts, of epic journeys both temporal and spiritual. There is a genesis story, a parallel to the Greek Persephone myth. There is the struggle of the desperately poor serving religious tenets that serve only to embed their poverty. It's all there. And not a single phrase of elegance or startling insight to lift the reader from a grey narrative to the chiaroscuro the story demands.